Double the stripes means double the nautical fun! Plus the sailors knot bracelet and starfish ring - it's nautical x4 and I love it. For the record, I had to iron this skirt this morning. I ironed, in the AM. Before work, even before coffee. I'm not saying I deserve a medal or anything, but it would be nice. This is super cute. I adore your skirt and that starfish ring is so cute. This is a perfect summer outfit. Loving the stripe on stripe combo! Your dog is super cuuute! I totally have that shirt, and I've never thought to wear it tucked in. Thanks for the inspiration! Good for you, I haaaate ironing! That does deserve a medal in my book! The stripes together are beautiful! Cute dog too!! This skirt is really cute and I love the striped top paired with it. You have no fear with your pattern mixing, which I love! I love your double stripes, and definitely double points for ironing - ever - let alone in the a.m. I hate ironing. Have you tried garment steamers? My husband had luck with those de-wrinkling his dress shirt. You totally deserve a medal for the ironing! And the double stripes and starfishy are super cute! I love the mix of stripes. I never iron, which is terrible. Cute! I love the two types of stripes. You are so funny! Quadruple nautical! You remind me of my friend who attends college in the other side of the country (booo...:( ). She just loves ANYTHING nautical; the more, the merrier! Goodness, I would not even wanna try to iron in the AM. I'm afraid I'll be too sleepy to even notice what I'm doing. I may even burn myself...eeks. You are an expert pattern combiner, seriously! Love the stripe-on-stripe and all the nautical elements. And ironing in the morning? Yeah, you definitely deserve something special for that. I love this look! And I like that it's not overtly nautical - it's very subtle. I really love the blues of that skirt! I've never seen a darker hued striped anything that I liked, that is, up until I saw your skirt. Consider yourself medaled! Two virtual thumbs up to you and I throw in a pat on the back. Loving all the nautical themes here! That starfish ring is darling! Adore the stripes galore! Sailing summer perfect. fantastic, love this combo... perfect! great pictures too by the way! I love the skirt with the belt, and the blouse with the tiny buttons! I love this whole outfit! And props to you for ironing this morning - I could never pull that off. Adore this outfit! I love anything nautical and this outfit is such a unique take on pattern mixing and nautical theme :D Following via bloglovin' woot! Great stripe and stripe combination! Yes, you do deserve a medal. One thing I miss about living at home is that my dad would do my ironing. My solution in the last few years has been to just not wear anything I need to iron! Love, love love your shirt and necklace. The stripe and stripe looks great and Chloe looks adorable, specially in the 1st picture. I guess I'm weird ... I love to iron. I love the double strupes. Your puppy looks so cute and fluffy in that first picture! I just want to squeeze him. Love the stripes on stripes look. I have been wanting to try it out! Love the mix of stipes! Your dog is so so cute!!! 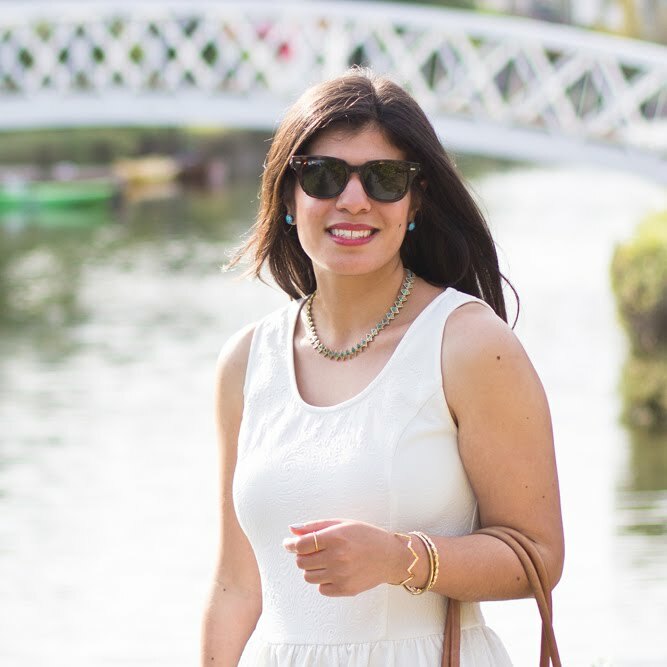 I am a new follower :) Found your blog through weardrobe and am loving it! hahahahaha okay you get a medal for ironing Lyddie =D plus you look cute. this is why I iron my clothes the night before. I can get nothing done before coffee, nothing. All nautical, all the time...love the outfit!! I wish I had more stripes so I could wear them together like this! Ugh I am like the worst ironer ever. I once went through this phase of ironing all my shirts right before I wore them. I'll give you 2 thumbs up and a medal for ironing...lol I'll also give you a hi-five for putting such a cute outfit together. I love the stripes on stripes! double the nautical fun! LOVE IT! this is such a beautiful photoshoot :) love the styling! i LOVE the stripes on stripes action! Such a cute outfit, somehow you make stripes on stripes work. Thanks for visiting my blog, would love you to follow. you look awesome! love the shoes and skirt! and the pup is adorable! This is very nice, like it ! You should get an award! If something needs to be ironed in the morning, it probably means I'll be wearing something else. And I'm loving the quadruple dose of nautical too! Seriously, can I just steal this whole outfit? I love every bit of it! awww, what a cute dog! such a cute outfit- perfect for the weekend, love your pooch! Come follow my blog gorgeousness! You look amazing. I love the outfit, and your dog Chole is sooo cute! ooohh!!! love the mix of stripes!! love the mix of stripes! I love the pairing of stripes. The skirt is so fun and cute. Great blog, I am now following. Love your outfit--and those shoes! So cute.